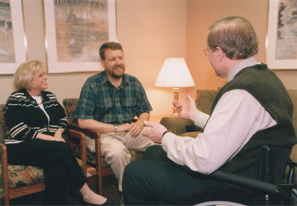 During the course of recovery from an injury, or adjustment to illness and other life-changing events, individuals often wish to discuss a variety of issues or problems with their therapist. Psychotherapy is the process of exploring emotional and other issues, and coming to a greater understanding of one's self, relationships and circumstances. Developing a more clear understanding of one's emotional issues is coupled with proven psychotherapeutic interventions that allow a person to make sound choices that will lead to living a life optimally. Significant others and a person's family may be involved in psychotherapy as appropriate. The general goal of psychotherapy is to assist people in arriving at solutions for a more satisfying life.